Uses scene markers to define the export range, instead of exporting the entire scene. Lets you select the unit conversion from Harmony to Unity, by selecting one of 4 presets. Note: a field is a unit of measure in traditional animation grid—see Modifying the Grid. Delete Existing Clips Select this option to delete clips that you already exported in the export directory. Instead of saving your character's animation as interpolations, this bakes them into frame-by-frame geometric transformations. This can help increase performance in your game, as your game engine will not have to interpolate your character's animations on its own. It will however create a heavier package. Clear Texture Folder When creating the sprite sheet, Harmony creates temporary files in a folder named texture inside the scene directory. 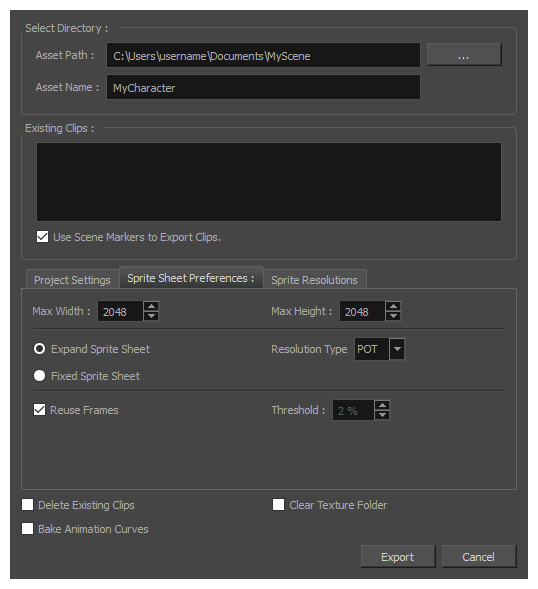 Check this option to automatically delete this folder after exporting your sprite sheets.